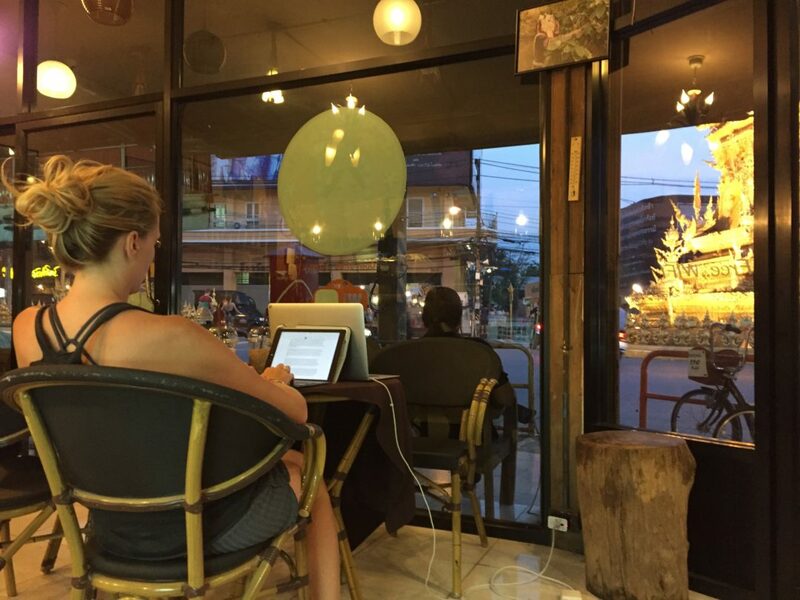 Currently, we are catching our breath in Chiang Rai, Thailand for a hot minute (it’s about 100 degrees here), sitting in a cafe across from a crazy gold-covered clock tower, sipping a SUPER strong green tea, while scooters and tuk tuks buzz by. We know it’s been a little while since we provided a general trip update, and thanks for your patience. The truth is, it has been a lot harder to find time on the road to post than we originally thought. Traveling is pretty much a full time job in and of itself and we are still getting used to this lifestyle, learning how to strike a balance between working on personal projects like Driftwood Traveler/Import and just plain traveling. It may take time, but well get it figured out, and we appreciate you hanging with us in the meantime. Anyways, I’m sure ya’ll are curious to know what we’ve been up to and have been eagerly awaiting an update, so I’ll start from the beginning. 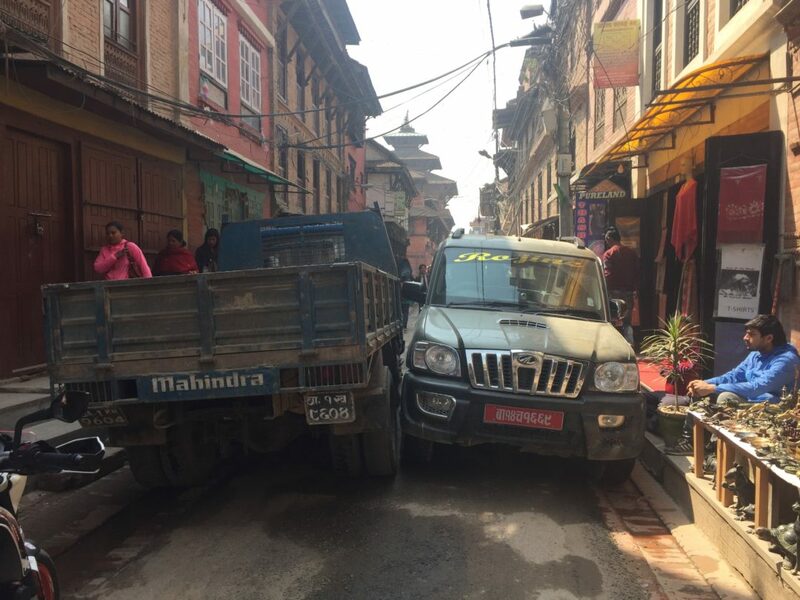 We started our trip in Kathmandu, Nepal. Boy, what a crazy city! Most of the roads were dirt, which meant there was dust EVERYWHERE, and there there were pretty much no traffic rules. Picture buses, taxis, motorbikes and cows all trying to travel the same street at once. Electricity wires hang from just about everywhere like crazy bird’s nests and the power regularly cuts out. You hear nonstop honking and people are moving random directions everywhere you look. All that said, the city is downright beautiful. 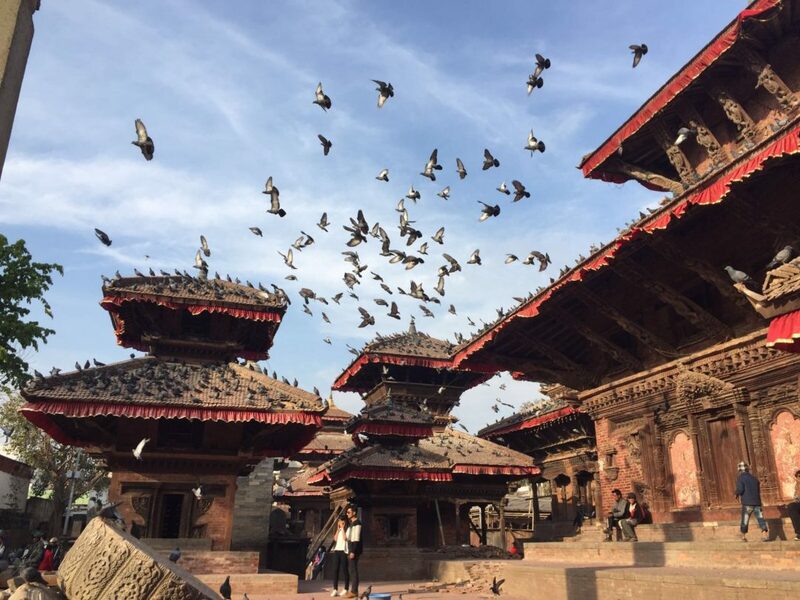 The colors, the smells, the people, the prayer flags and the temples. We spent about four days here planning our trek to Sagarmatha National Park, home of Mt. Everest. From there we flew to Lukla, Nepal which required taking the most dangerous flight in the world as the plane literally flies between the mountains and lands on an upward slanted runway! We ended up deciding on the Gokyo Ri Trek, which runs through the Khumbu Valley, parallel to the Everest Base Camp trek. 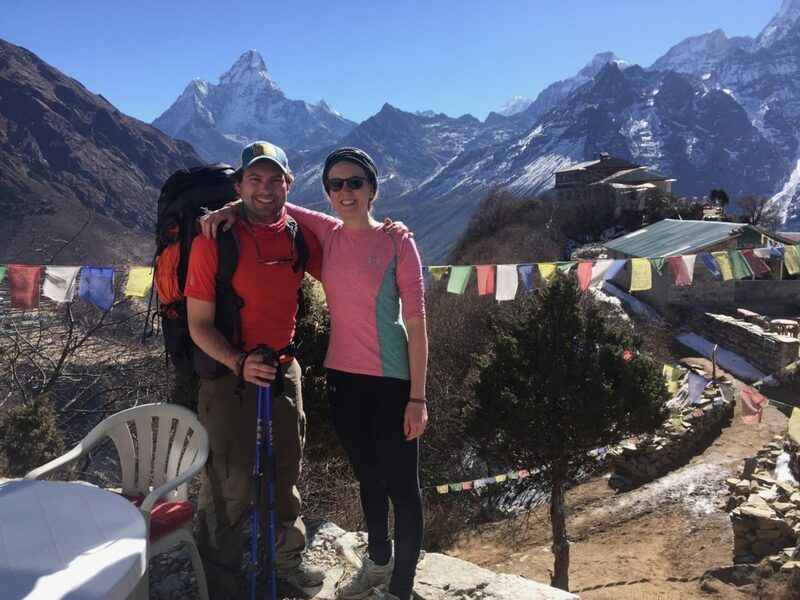 As most people head to the region to hike to Everest Base Camp our route had a lot less people, and even more stunning views of Everest herself. We spent 12 days in total trekking and the entire journey was completely remarkable. Each day we hiked anywhere between 4-9 hours, staying at tea houses in little mountain villages. The lodging at the tea houses consisted of a simple private room with twin beds and a main room where everyone would congregate to drink tea and scarf down unlimited helpings of Daal Bhat, a local dish of rice and lentil soup. This was the only heated room and at night it was COLD! We often slept in our down jackets with hoods on, inside down sleeping bags with blankets piled on top to stay warm. However, in the mornings we would wake up with the sun shining and clear blue sky and often be hiking in nothing but a base layer on, it was so warm. There were amazing views throughout the entire hike but the further we ascended the more stunning they became. 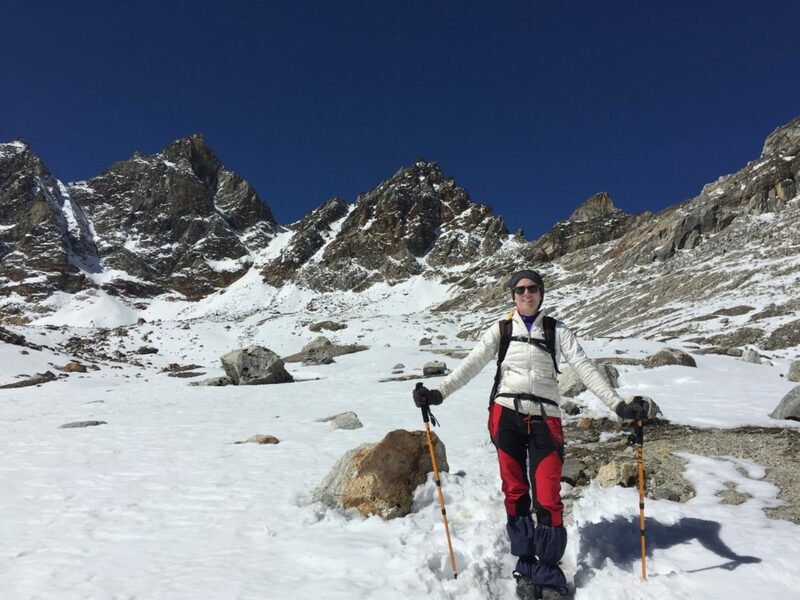 The most rewarding scenes of the Himalaya came when we climbed Gokyo Ri at 17,575 feet and crossed the Renjo La Pass at 17,800 feet. Both spots provided panoramic views of the Himalaya mountain range, which contains four of the tallest mountains in the world. Seeing the vastness of these great mountains towering into the deep blue sky is one of those experiences that is so beautiful it brings tears to your eyes. The Himalayas are simply breathtaking, and you have to pinch yourself to believe what you are staring at is real. Overall, this was the hardest physical challenge we had ever undertaken. In 12 days we hiked approximately 70 miles with our backpacks, ascending and descending over 13,000 feet and spending over seven days above 14,000 feet. Having never been above 14,000 feet before, the high altitude was no joke. The higher up you go it becomes exceptionally hard to breath and every step you take leaves you gasping. Additionally, there is no running water (which pretty much took showers out of the equation) and only solar generated power. Throughout the entire trek we only had maybe three showers as most of the tea houses were not equipped with hot water. By the end our legs were Jello and both of us were exhausted beyond belief. 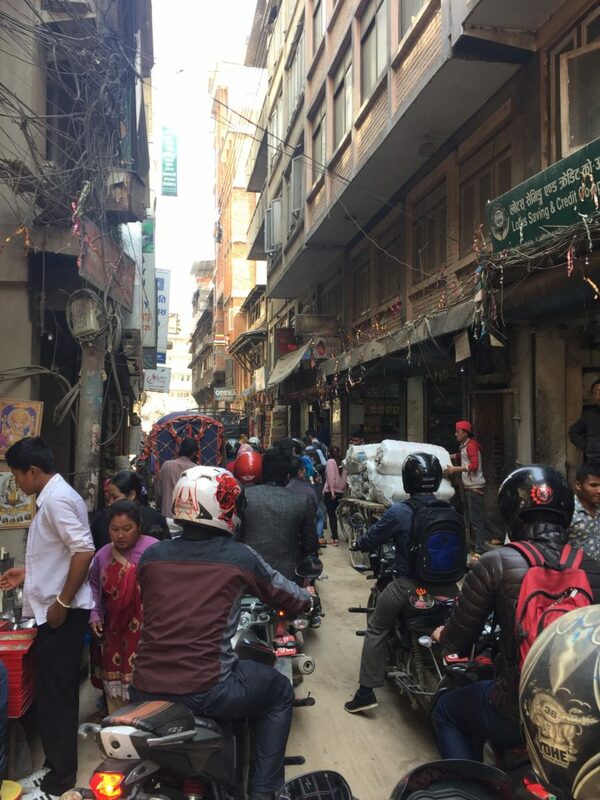 So the day we landed back in Kathmandu and after our first real hot shower in two weeks, we headed straight to an Internet cafe and booked a flight to Bangkok, Thailand for the next morning. 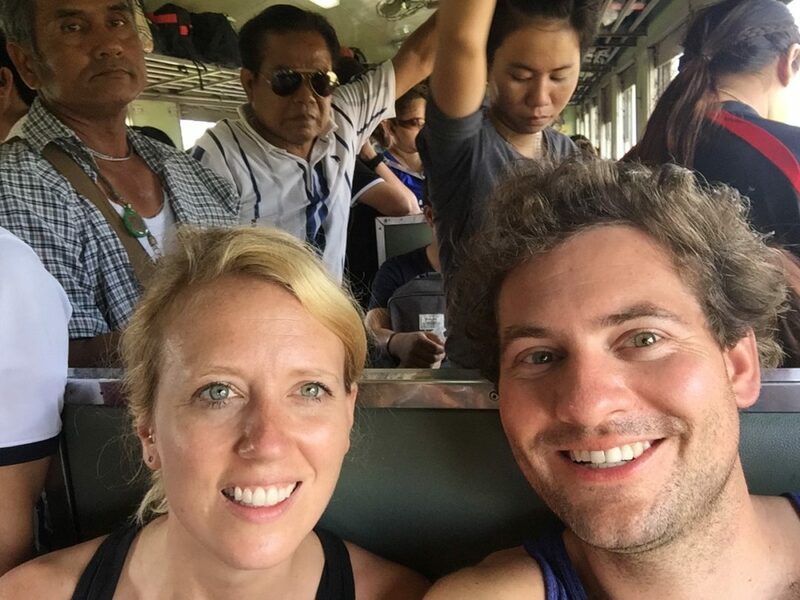 We landed in Bangkok on April 1st, eight hours later after a brief layover in India. 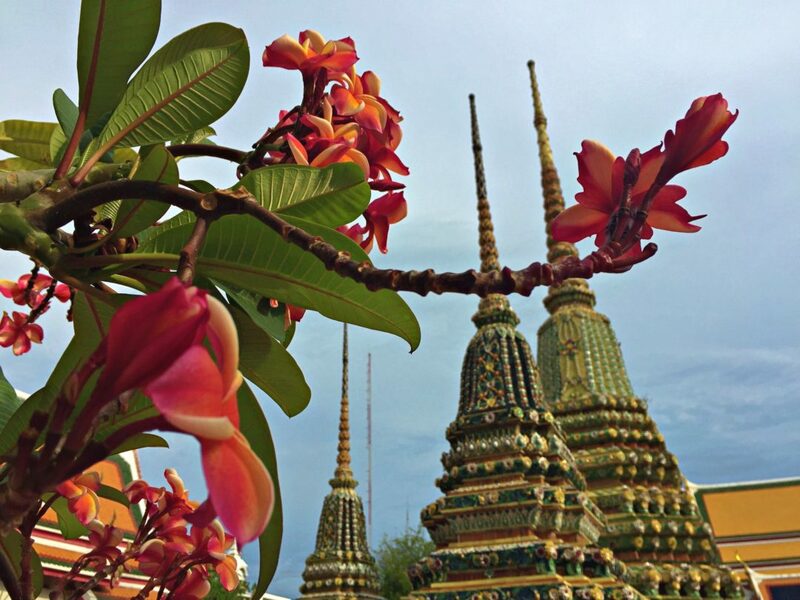 After Kathmandu, arriving in Bangkok was like stepping into a luxurious tropical paradise! The temperature was a balmy 80 degrees, there were street lights and traffic lanes, trees everywhere, clean air and delicious restaurants and street food on every corner. 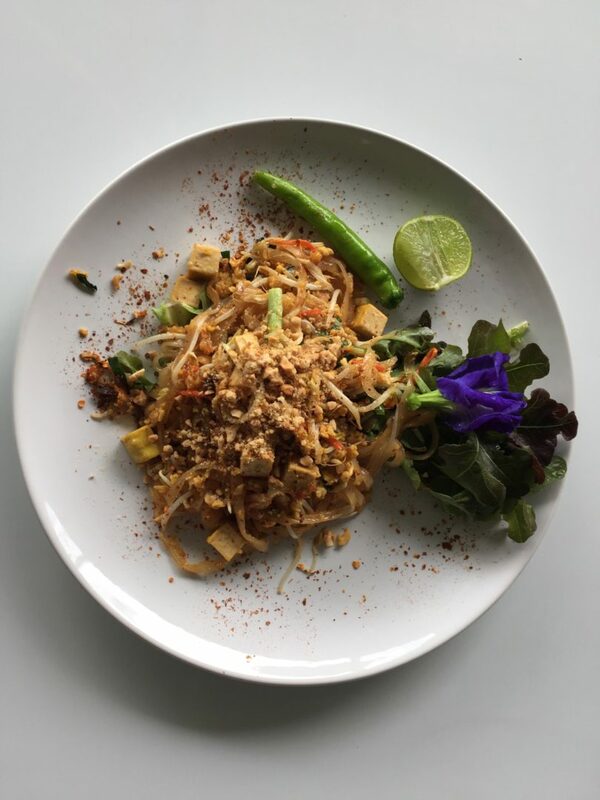 After arriving at our hostel we dropped our bags and headed to a street market around the corner to get our first taste of authentic Pad Thai. For dessert we stumbled across a dish called Mango Sticky rice… how have we never had this ambrosia of the gods before?!? This is the most delicious dessert ever: fresh mango with salty and sweet sticky rice topped with coconut cream. Ahhmazing. The next morning we headed straight to Koh Samet Island for some much needed R&R after the trek. Koh Samet is a short day-trip away from Bangkok and you can get there easily by taking three hour bus ride and then hopping on a 30 minute ferry. We found a cute little beach bungalow resort called Tubtims that was only $30 a night and posted up for the next 4 days to rest, recover and soak up the sun. 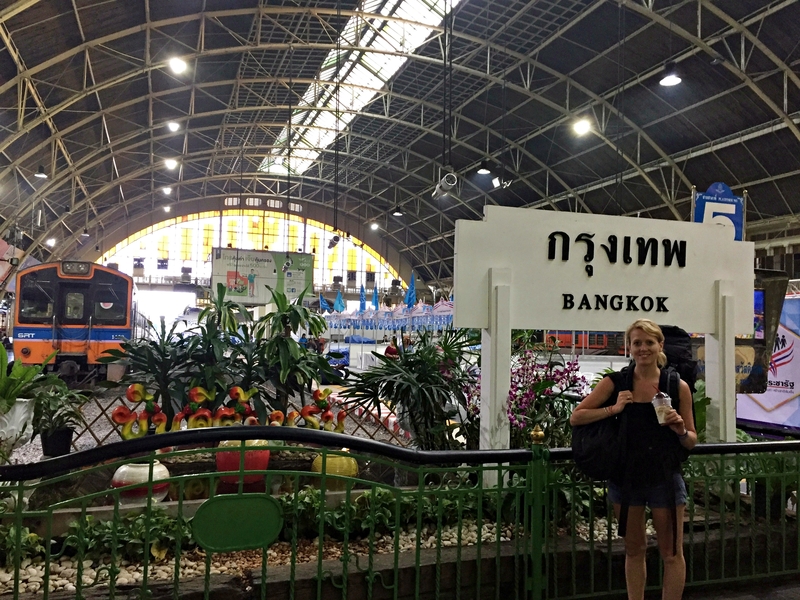 After returning from Koh Samet we decided to stay in Bangkok for a few days to explore the city. 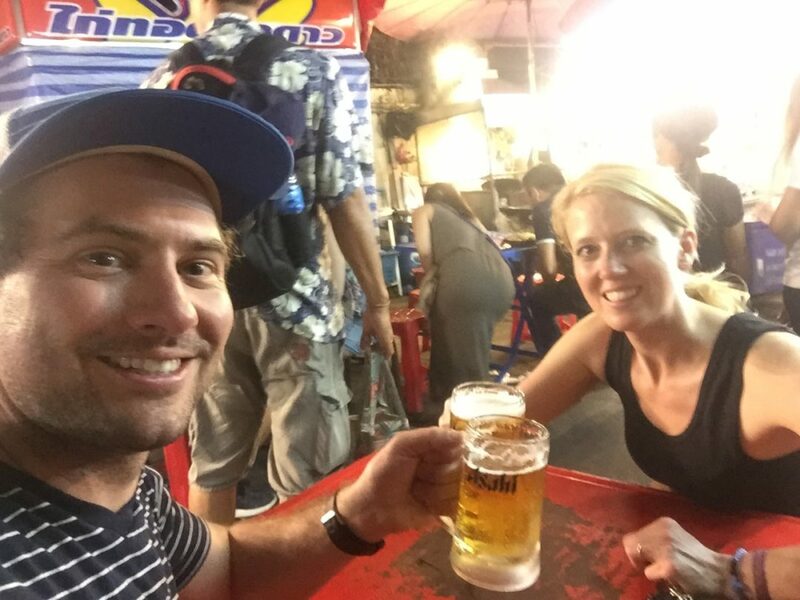 We visited temples, had our first Thai massages, found some incredible vegetarian food, and partied on Koh San Road, a famous backpacker destination in the area. Charlie ate a fried scorpion. Why? Who knows. Thailand celebrates its New Year with a huge water festival called Songkran starting on April 13th and we had heard the place to be for it was Chaing Mai, the largest city in the North. 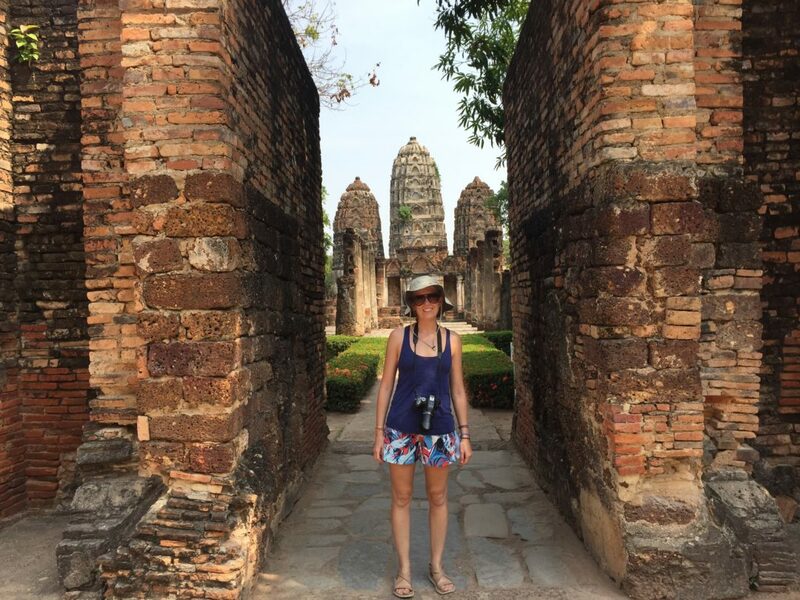 We decided to slowly make our way there, stopping in the ancient city of Sukothai for a few nights, the first capital of Thailand, known for its national park with hundreds of ancient ruins. We took a 7am train north, which was an adventure in itself. Because we had booked our tickets last minute during a holiday week, the only seats left were 3rd class, fan-only seats. We decided to go for it and while it was a “local” experience, it was definitely trying. It was insanely HOT, and we were crammed into a car for 8 hours with a basic cushion bench and people standing around the seated passengers. Vendors selling food and drink constantly squeezed themselves through the aisle of standing people, making the crowded train even crazier. To make matters worse, we were trying to limit liquid intake since the bathroom situation was impossible. But we survived and rolled into the station only about 1.5 hours behind schedule. After taking another sweltering 2.5 hour bus ride, we finally arrived in Sukothai. Thankfully, our guesthouse had a pool for us to cool off in, which was much needed after a long, sweaty day of travel. 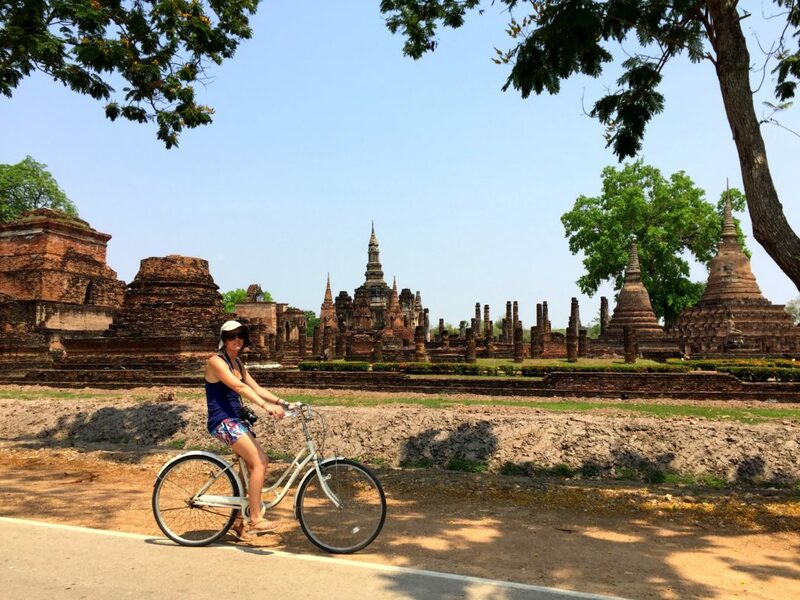 We spent the next day biking around, exploring the ancient ruins and taking in the scenery. However, by late afternoon the heat had got to an unmanageable temperature so we yet again retreated to the pool. Then it was off to Chiang Mai, to arrive a day before the Songkran New Year festival was set to begin. The festivities started early and people were already squirting each other with water as we arrived. We quickly armed ourselves with the biggest, most powerful squirt gun we could find and a plastic bucket! Yes, that’s right, a bucket. Because at this festival it’s completely cool and expected to dump buckets of water on people’s heads. If ice water is available, all the better! We spent the next 3 days in an all-out water war, completely soaked from morning to night. 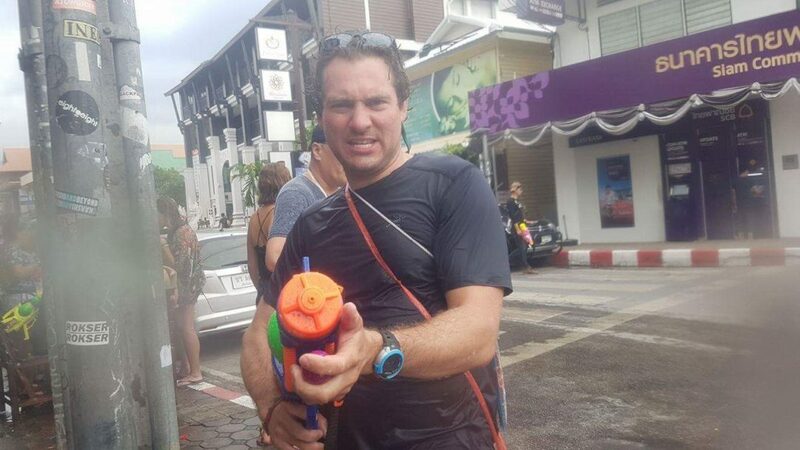 There is no mercy during Songkran and if you are out walking the streets you will get completely and utterly drenched from head to toe! The most amazing thing about the whole experience is how friendly everyone remains during the whole week. 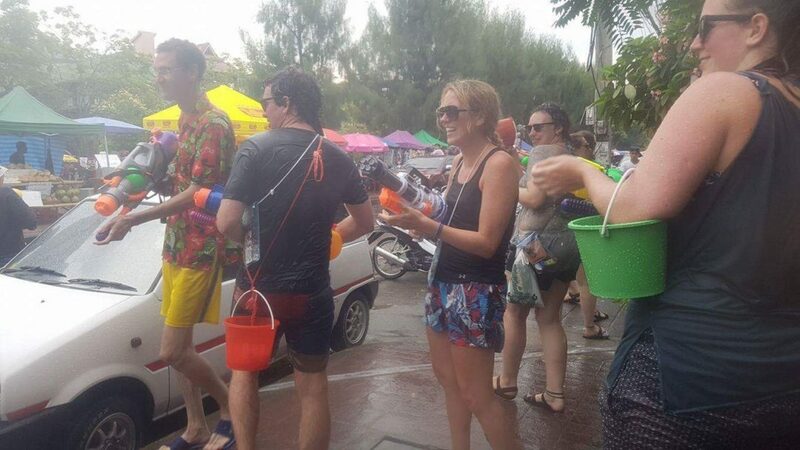 The city (and whole SE Asian region, actually) comes together to celebrate and foreigners and locals alike all have fun soaking each other without violence or heated words. 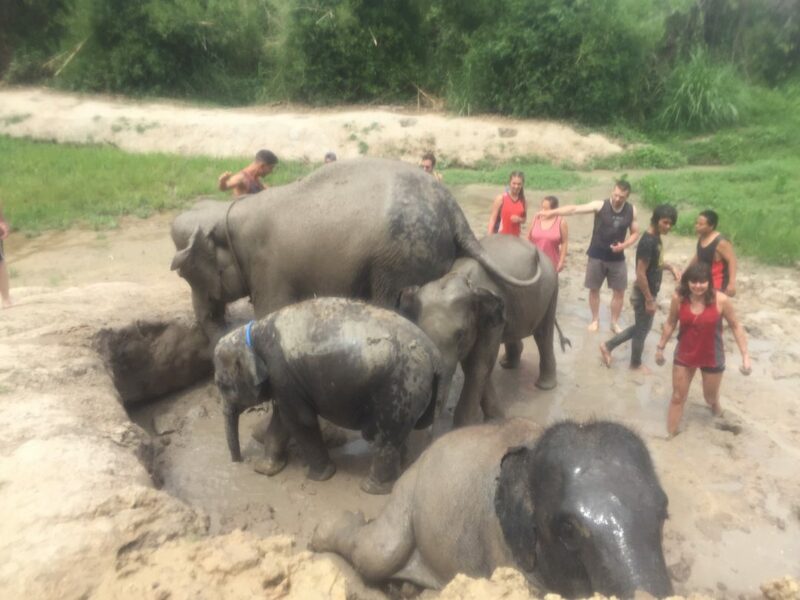 Given it was hard to do any sightseeing or touristy things during the water festival we ended up staying a few more nights in Chiang Mai than we originally anticipated. 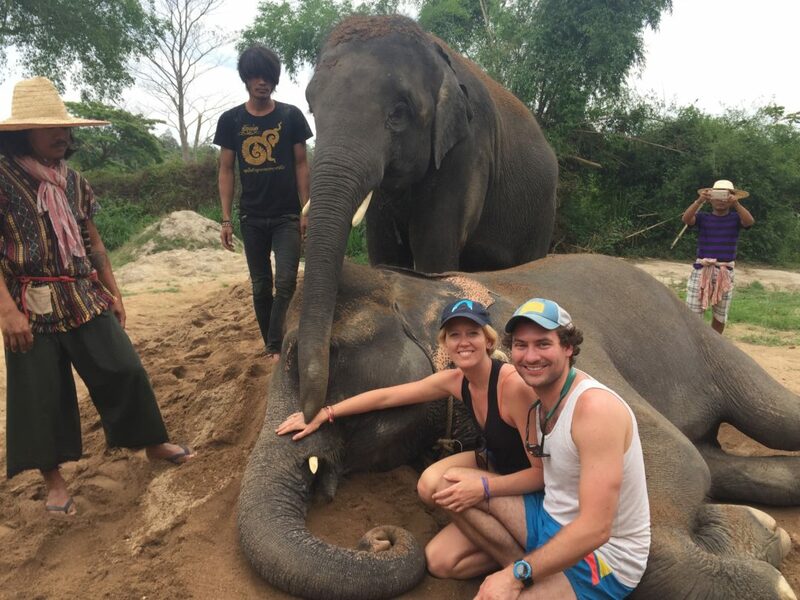 We spent a day at an elephant retirement park where we helped feed and wash the elephants and another day learning how to cook traditional dishes, like Pad Thai. 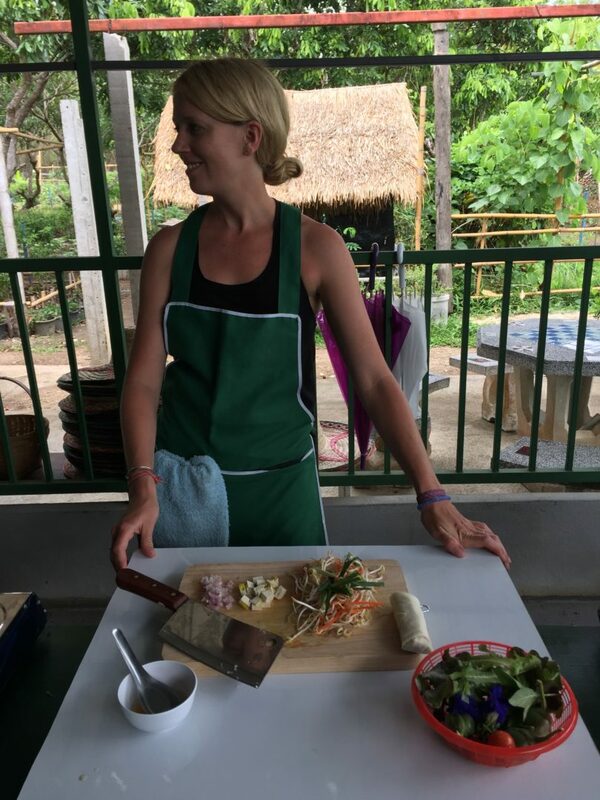 Unfortunately, the cooking class most likely resulted in me ending up with a serious bout of food poisoning that night; A SUPER fun experience that most travelers experience at one point or another down here. After a full day spent in bed recovering we spent the next two days at a silent meditation retreat with the Wat Suan Dok temple north of the city in the countryside. The retreat was led by an English speaking monk. It was such a unique opportunity to a) speak to a monk and learn more about their lives and b) learn more about Buddhism and meditation practices. We walked away refreshed and with some new perspective about how to keep calm and quiet down the “monkey mind”. 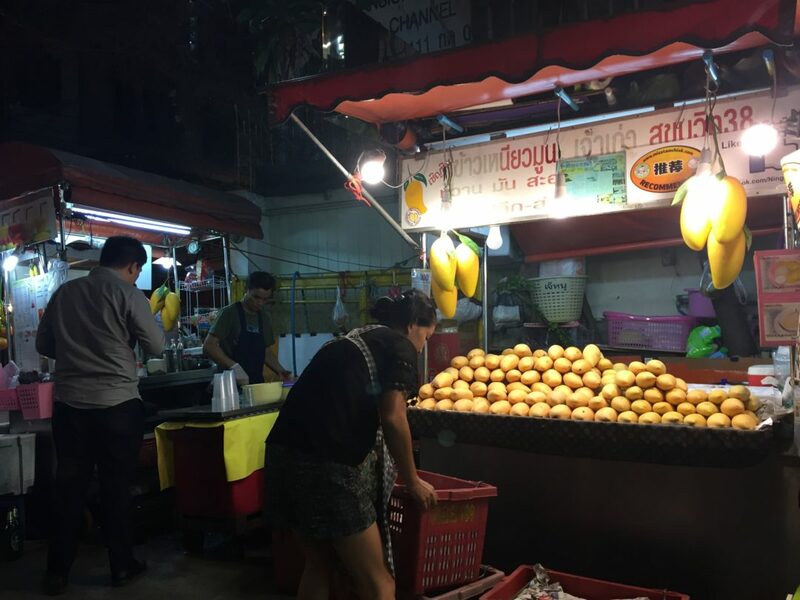 Chiang Mai has so much to do that even after a week we felt like we only scratched the surface, but it was time to move on. From there we took short bus ride to Chiang Rai, a smaller town higher up in the mountains, where I am currently writing this. The main reason for coming up here is so we can head to the border of Thailand to cross into Laos, but we decided to stop and catch up on things for a few days and do some trekking. 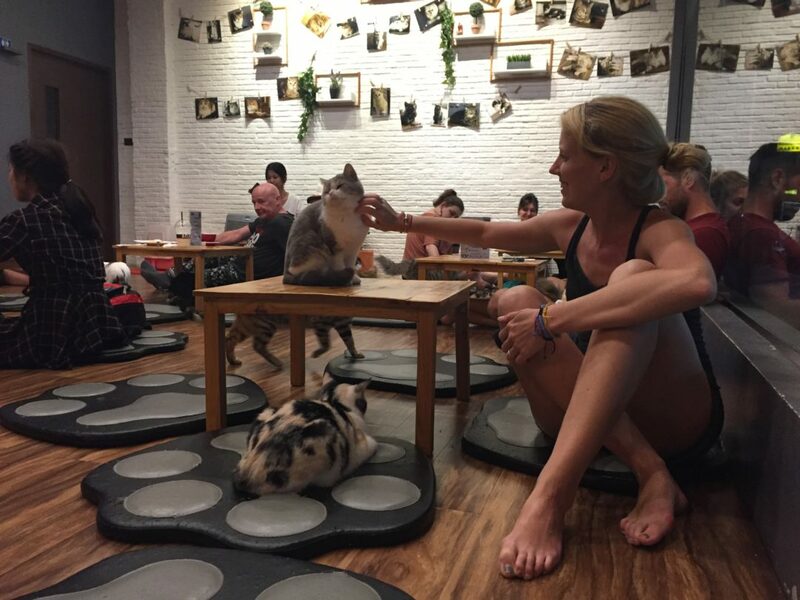 Additionally, there is a cat cafe here where you can sip coffee, have a meal and play with numerous cats, if you so choose! No kidding, this place has around 25 cats roaming the cafe for patrons to hang out with while eating spaghetti and cake. Anyways, enough about cats. In a few days we head to Laos and plan to take a slow ferry down to Luang Prabang. Currently our plan is to travel in Laos for around 7-10 days and then head to Vietnam followed by Cambodia. There are so many more stories to tell and details to break out, which we plan to do in separate blog posts, but we at least wanted to get something out there for you all to be able to share in this experience with us. If you have read this far, thank you, we appreciate it! One of the hardest things about traveling is missing family and friends, so if you are thinking about us, don’t hesitate to reach out and say hello, it makes our day. Hopefully we will be able to post more regular updates, so keep checking back for new stuff! Also, if you have any questions or interesting topics you want to hear about or us to write about, send em’ on over.